So I bought the Azumi at Gardiner Houligate auction the other day and have been playing it a bit recently. 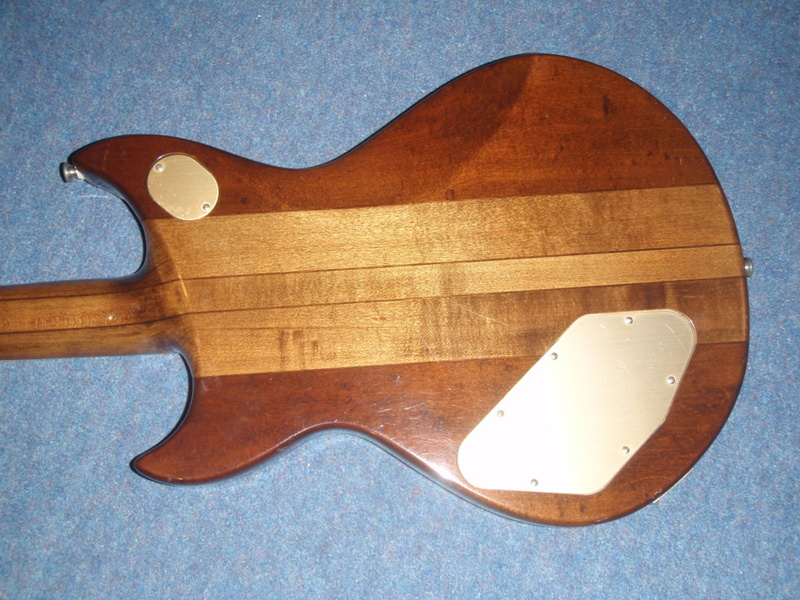 It is fantastic quality, but needs a fret dress to tidy it up. 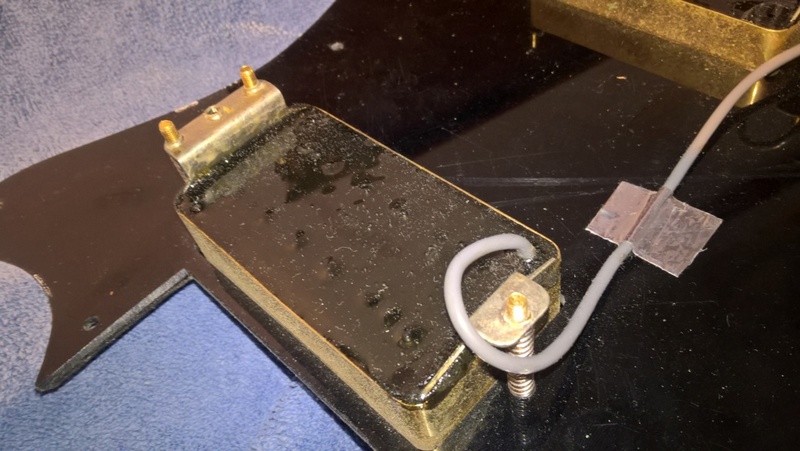 My question is, upon opening her up, the tone pot (I assume it's that anyway), isn't connected as a tone pot should be. The orange wire come out of the on-board pre-amp, (which is inside a mass of white mastic). The centre connection on the pot has never had anything connected to it. the other end connection on the pot has solder on it, but that's all. It isn't connected to ground, and doesn't seem to have been ever been. 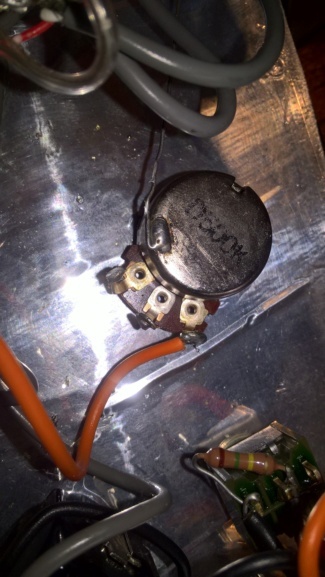 I can't think why it should be connected to ground either as it would just be connected to the other end of the resistor in the pot that the orange wire is attached to. the middle terminal gives the variable resistance after all, but this connection is completely clean. It looks like it left the factory in this condition as it doesn't seem to have been fiddled with. Other than not having a tone knob, it all seems to work fine. Boost is "Bass" (which sounds really nice), "treble" and "full range". 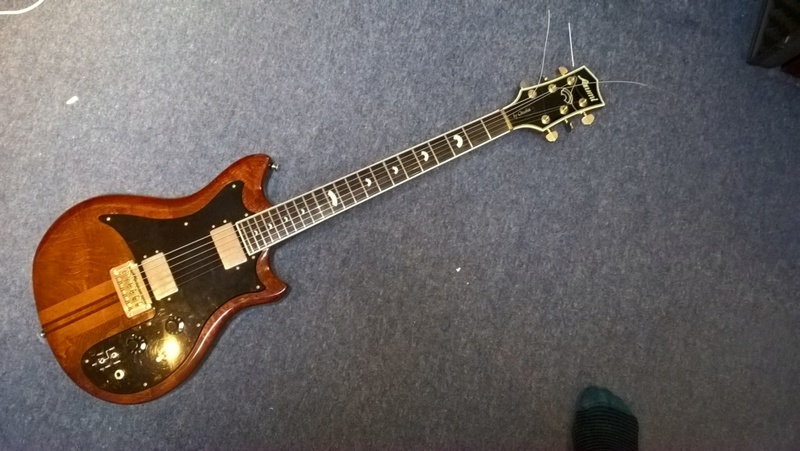 Looks a very decent guitar, nice woods. Does the pot do anything? If not put the tag with solder on it (left side as you look at it) to common and see what happens. Might have a cap in circuit in the pre-amp. I thought about that, but the two outer tags are either end of the resistor in the pot. The middle tag gives the varying resistance (I thought, but I could be wrong). I'll give it a go though.. I'll get my voltmeter on it first and check it doesn't have any voltage before I ground it, just in case something in the circuit doesn't like it. I connected the previously soldered tab to earth - nope. No difference. 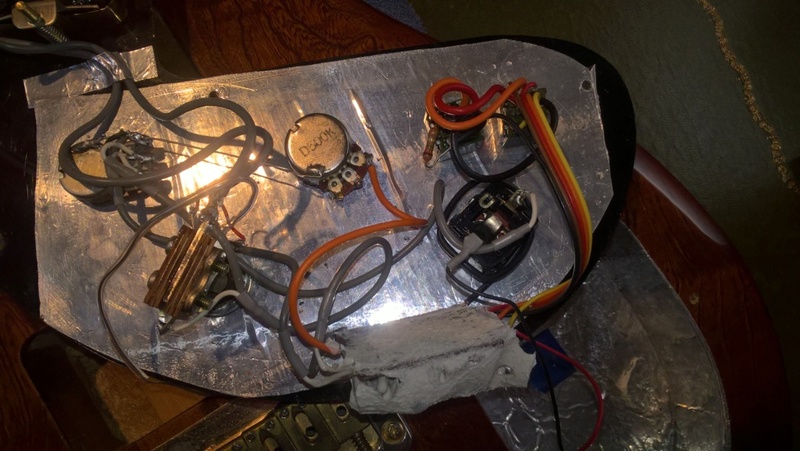 Hey presto, a functioning tone pot! I think it must have confused the original person doing the wiring as there wasn't a cap to install when building it. It confused me too! Pot gives a large tonal range. I notice it is a D taper pot too, which upon looking it up is an exagerated B taper. 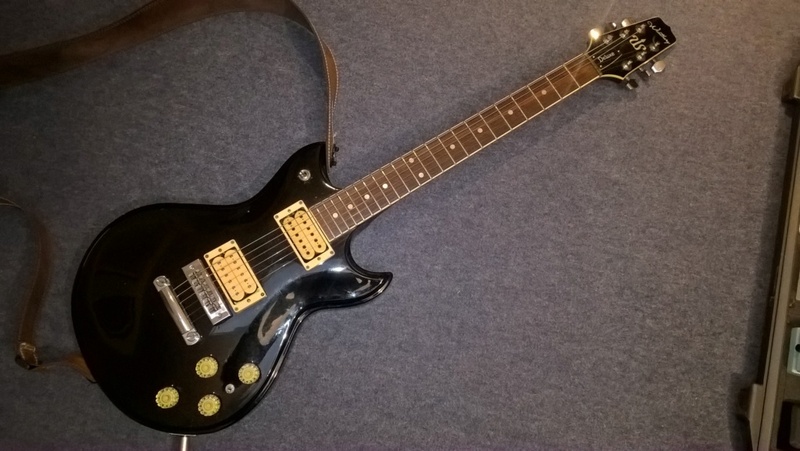 Anyway, a really nice guitar. I'll sort the frets out sometime soon. 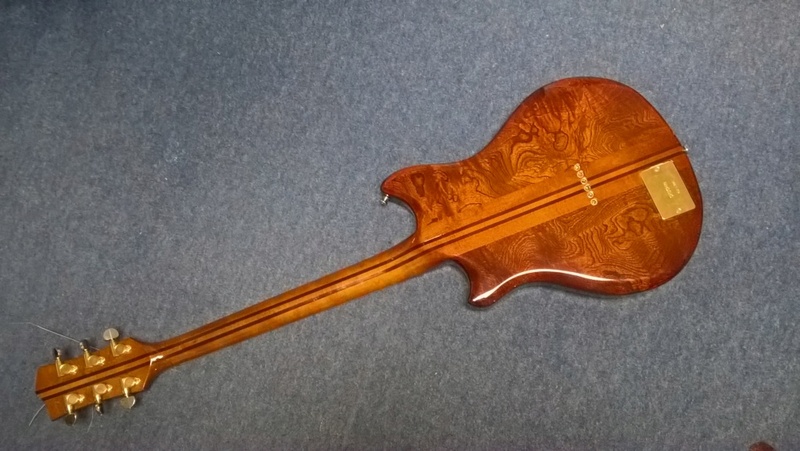 The neck is nearly flat though, hardly any bow, even with the truss rod backed off all the way, but that might be becuase it has been left with no string tension for years perhaps before I bought it. It's strung now with some slinky top and heavy bottoms, which might help pull it back a bit. If not, it might need a bit of gentle tension introduced to the neck and a bit of warming up to help it move back. Overall though - really pleased with it. Haven't seen one of those before, WOW! It's made by Chushin who also made my Bambu and various Maya guitars. I think they may have made some Daions as well as there are similarities with others. Pickups in this one look like Maxons that have the solid covers on them. They have then been resin potted by filling them up from behind. Nice smallish body, but how's the weight with that neck-thru? I haven't got anything particularly accurate to weigh it with, but it seems to be about 10lbs 2 oz. 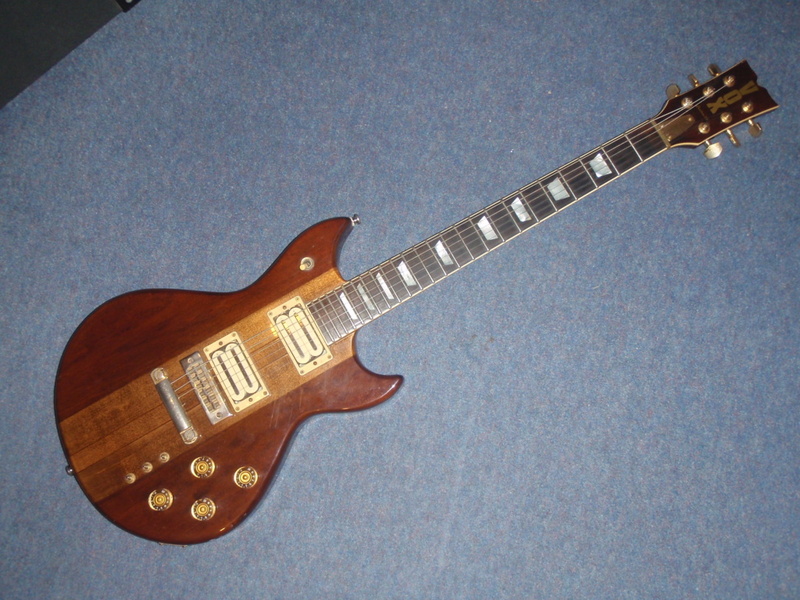 and my Westbury Deluxe weighs over 11lbs, but it is made of that well-known tone-wood - concrete I believe. Some nice geetars there m'lad! Always had a hankering for a Westbury.